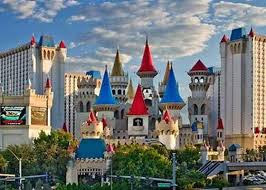 If you are harboring thoughts of bringing the family for a Las Vegas vacation, then perhaps you should seriously consider a stay at Excalibur Hotel and Casino. This hotel will have you feeling as though you've stepped into the fairy tales of your childhood. From the moment you cross the threshold from the outside world to the charmed existence of life in the hotel you will find that you have truly been charmed and are leading a somewhat enchanted existence. 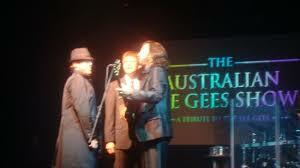 and relies heavily upon audience participation. Dining in the hotel and casino can be quite the adventure without the assistance of horses and actors as there are several dining options including the Roundtable Buffet, The Steakhouse at Camelot, Regale Italian Eatery, Sherwood Forest Café, and how could we forget Sir Galahad's Pub and Prime Rib House? If you're looking for the fairytale wedding of your dreams, then Excalibur has the package for you. You can even elect to rent medieval costumes in which to get married. There are many different packages available to fit various budgets and wedding needs. Wedding packages vary in price from around $400 plus $55 for the cost of the minister to around $1575 plus the cost of the minister. These are all rather basic packages and do not include extras such as costume rentals, extra poses for the wedding photos, or video and candle services. 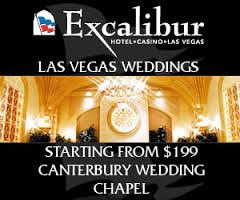 Before your big day make sure you make liberal use of the spa services available at Excalibur Hotel and Casino in Las Vegas. Of course this is a great idea even if you are just hoping to relax while on vacation. You remember relaxation right? That is what you did on occasion before you had children. You should definitely get the royal treatment that is available through the spa and enjoy every minute of your visit. Some of the spa services offered at Excalibur include: facials, wraps, Aveda facials, and various massages. There are add on services that can be purchased and packages available. This is a great way to spend an hour or three before your big day or any day. 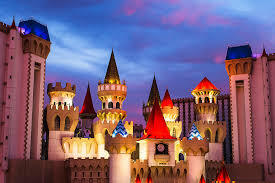 Excalibur also offers full service catering and convention services. Whether you are hosting a wedding reception or a company convention we have the facilities as well as the expertise to keep everything operating seamlessly behind the scenes so that all eyes will be on the things that are important. 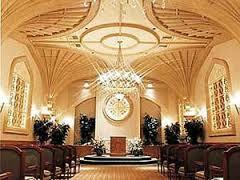 Projections and profits for the corporate conventions and the bride and groom for wedding receptions. and accommodation needs for those staying and playing in Las Vegas, more than that we can provide a great 'fairy tale' atmosphere for your family vacation or just your big trip in general. If you haven't given proper consideration to the idea of staying here during your visit, I highly encourage that you do-especially if you have a little princess in your party that you are trying to impress.